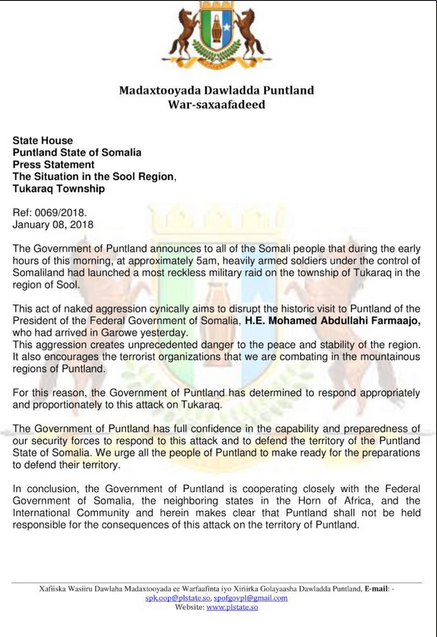 Fantastic news, I hope farmajo troops to step inside Somaliland and receive their majestic whooping,it would be an entertaining scene indeed. He knows what to do before Idoor reach him in Garowe..
hahaha, we advise him run to nigeria, and die. like the previous faqash leader. this land belongs to JSL faqash beentey isku shegeysey maanta seige baa lagu haya tulo hee yara ee biyo qadaandka ee garowe. i see in the near garowe oo laga qaxey, walee faqash iyo muj muse isma baraniin. hagey ku dhamaanty ba la arki. just a quick questioon is this town part of SL or PL ? Im assuming its part of Puntland from the title. It's a small village on the road, halfway between Lascaanood and Garoowe. Somaliland never really used to care what happens over their, until very recently when ministers from Somalia started visiting parts of Sanaag to stir up trouble. BREAKING NEWS! CNN- ETHIOPIA INVADES SOMALIA.. BREAKING NEWS...Switzerland Invades Lichtenstein !!!!! !